This category is dedicated to answering questions submitted by readers. If I can’t answer it, odds are, I know a fellow anthropologist who can. 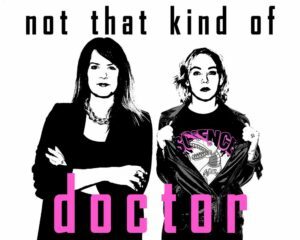 Interview with “Not That Kind of Doctor” Podcast! Posted on December 4, 2017 by H. W.
If you want to hear me chat about Anthropology and its relation to STEM and the rest of the world, check it out! Posted on July 7, 2017 by H. W.
I’m starting a new blog but don’t worry, I can explain! As the readership of my Peregrinations blog has grown, it has become clear to me that the content of this blog should primarily focus on my ethnographic work, on Shaligram research, and on my continued relationships with the Hindu and South Asian community. In other words, it has come to my attention that the readership of Peregrinations is, aside from friends and family, almost exclusively Shaligram or pilgrimage based and, as such, some of my more general, political, or media oriented commentaries aren’t fitting to the readers. Therefore, I am splitting my online writing into two sites. Peregrinations will now focus completely on my anthropological and ethnographic work. I will continue to post about my publications, my research, Shaligram discussions, my work in Nepal and India, and so on right here. However, my new blog, Mocking the Apocalypse, will now focus on the particularly political, social, religious, media, and popular culture discussions I tend to engage in otherwise. So, if you like my writing, feel free to follow both. But you’ll have to catch my more controversial arguments at www.mockingtheapocalypse.com. Posted on May 18, 2017 by H. W.
In April of this year, shortly after leaving Nepal, I had the distinct pleasure to conduct a two-day Shaligram seminar for the Hindu Cultural Society of Staffordshire in Stoke-on-Trent, England. They were also kind enough to film the seminar and, though some parts of the workshop portion of it is difficult to see on the video, you can view the entire talk at the links included below. 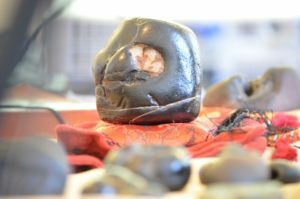 Posted on July 30, 2016 by H. W.
I was recently asked (and not for the first time), what I do with all the Shaligrams I accumulate over the course of my research. It’s a great question, and I think, a particularly important one because it speaks to concerns many pilgrims and devotees have about how these sacred stones are treated in the hands of someone (meaning me) who may not necessarily use them for their more ubiquitous ritual purposes. Additionally, I am often in possession of quite a fair number of Shaligrams, many of which have been collected directly from Kali-Gandaki River, where the bulk of my research takes place. In the interests of the ethical practice of anthropology, the majority of these Shaligrams are given away. In many cases, the Shaligrams I collect in Mustang are gifted to pilgrims I encounter during my travels, especially if I have a Shaligram specific to their needs or desires (for example, a Mahavishnu Shaligram the person in question has been looking for but unable to find). In other cases, I am able to answer direct requests from Vaishnavas in the United States who are otherwise unable to undertake Shaligram pilgrimage (though I am not able to do this very often). In just a few days however, I will be able to send a group of Shaligrams I collected in June to a new temple being built in the UK. 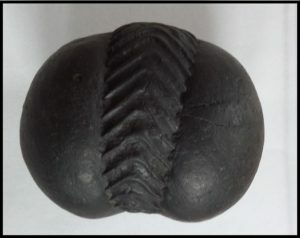 I am especially pleased that I am able to do this because it provides opportunities not only to experience a wide variety of the Shaligrams themselves (without also needing to accept the substantial responsibilities of caring for so many stones) but also to follow the stones outwards and meet the people most involved in Shaligram practice. In that way, I am not just a researcher of Shaligrams but I am also a direct participant in their mobility. And for those of you who have been following along for awhile, this theme of mobility will have special resonance. Lastly, this is not to say that I do not have any Shaligrams at all myself. I have decided, once again in the interests of research, to keep one in particular that I have developed a rather special fondness for. This Lakshmi-Narayan Shaligram (pictured below) came to me as part of a group of Shaligrams I was bringing to a Vaishnava specialist in Kathmandu for identification. The rest of the group have since gone on to better practitioners, but this one was so unusual and so striking to my eye that I decided to keep it and, under certain circumstances, use it for teaching and demonstrations. Today, it lives in a small puja mandir in my office at home in Boston and, should I ever bring it out to the benefit of my students and colleagues, I am careful to observe the necessary ritual hand-washing procedures (I do not allow others attending the class or presentation to touch it), abstain from meat prior to handling, and ensure that the Shaligram never comes into contact with the floor, feet, or mouths. It has been a privilege to conduct this work and I look forward to a great many more wonderful experiences in the world of Shaligram. As such, it is equally important that I continue to regard the objects of my inquiry with the respect they are due. This is true for the humans in question, just as much as it is for the Shaligrams. Posted on July 21, 2015 by H. W.
Clothing is an important part of fieldwork. And by this, I don’t just mean planning for inclement weather or deciding which pants are more likely to hold up through months in the jungle. For many anthropologists, clothing choices in the field must also often reflect the cultural norms and mores of the people with which we could be spending up to a year or more living and working with. For this reason, many anthropologists in the field tend to adopt local dress codes, both as a method of participating closely with and respecting cultural attitudes (especially certain attitudes regarding religion or gender) and as a way of indicating our insider/outsider researcher status (as opposed mainly to ‘tourist’) among groups of people who may otherwise find our long-term presence strange. During my first fieldwork project in West Bengal in northern India, my decision to wear the Indian sari fell along these lines. In response to local concerns regarding Western clothing in an especially holy pilgrimage site for Hindus and concerns about certain styles of Western clothing popular among urban women, I wore a full sari each day without question. I also found it to be an important learning experience. The rapport I quickly built with the elderly women who taught me to properly tie the garment paid off in other ways as well, particularly in invitations to attend religious rituals or in invitations to household meals and other events. Additionally, my willingness to wear saris was also taken as an indication of my openness to other kinds of cultural participation, such as learning religious mantras or taking instruction on how to care for a material deities placed in people’s homes. But as I began to travel outside the pilgrimage temple village into the surrounding rural areas, I started to run into an interesting and unexpected problem. To many villagers not directly involved in pilgrimage activites, a young white woman in a sari had another meaning: as a statement of religious affiliation. In this case, my country of origin combined with my choice to dress in the traditional sari meant, to them, that I was a devotee of ISKCON (International Society of Krishna Consciousness or, as they are known in the United States, the Hare Krishnas). And as a presumed devotee of ISKCON, many were uninterested in speaking with me. However, this was not a statement on their parts that indicated that they particularly disliked ISKCON but more that they assumed I had a conversion agenda and that I didn’t actually know anything about Vaishnava practice more prevalent in village contexts (I won’t go into the details here but suffice it to say that Bengali folk Vaishnavism and ISKCON Vaishnavism have a number of significant differences). They also assumed I didn’t know the local language, since international devotees on pilgrimage rarely do. Shortly after my initial experiences then, I decided to modify my daily clothing to appear somewhat more Western (though not overly so). I started dressing in kameez shirts and loose, linen, pants, and if I wore a dupatta (a kind of long scarf) I stopped using it to cover my head. I still kept my hair up, however, and still wore hand-dyed Bengali patterns and fabrics whenever possible. The results were immediate. In the surrounding villages, I was met with an equal amount of hospitality as before, but this time with greater interest in what my work was about and did I want to talk more, where was I coming from, and how had I learned to speak so much Hindi in such a short time? Now, currently working in Nepal (though on similar topics of religion, pilgrimage, and sacred objects), I’ve maintained this sartorial strategy. I have neither adopted the Indians saris of Hindu pilgrims to the region (as that would actually mark me to the local peoples as “Hindu”) nor do I dress in the styles typical of Nepali women (as styles here are highly varied and often have connotations of ethnic identity). However, I do incorporate both Indian and Nepali styles mixed in with the sturdy trekking boots and canvas pants vital for mobility in the high Himalayas. This way, I remain clearly a cultural outsider (neither Hindu nor Buddhist, not Indian, not Tibetan, and not Nepali), but to the interest of many, I am also clearly not just another Western tourist here on holiday. My use of both Hindi and Nepali in social situations and my habit of taking my meals with the local families (rather than in the dining halls with other trekkers and tourists) also helps. For example, in one particularly amusing exchange, I once had to explain to a guesthouse owner that the other “white people” in the dining hall he kept encouraging me to socialize with were from Belgium and that I spoke neither French nor Dutch. I did, however, speak Hindi and therefore I actually could socialize with the Indian and Nepali pilgrims and families separated out in the sitting room. Posted on April 24, 2015 by H. W.
Ever wanted me to answer all those pressing questions you keep meaning to ask? Ever wonder how I successfully link Chuck E. Cheese metaphors with ethnographic fieldwork? Check out my interview on this week’s episode of “This Anthropological Life!” Hosted by Ryan H. Collins and Aneil Tripathy. Preparing to Publish and Seeking a Title!